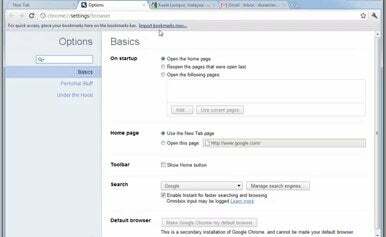 The new Browser Settings interface now appears as a tab in the browser, rather than as a separate box. It also features a search box for quickly finding the settings you wish to adjust. For instance, if you want to import bookmarks from another browser, simply typing “import” in the search bar will bring up an Import Bookmarks button. Chrome’s address bar—Google calls it an OmniBar—automatically displays a direct link to whatever preferences you are adjusting, meaning you can help friends and family customize Chrome by simply sending a link to different preferences you want them to adjust. Google has also beefed up Chrome’s security, disabling certain outdated plugins by default and providing options to update to the latest version. This will keep outdated versions of popular software, like Adobe Reader, Java or Quicktime, from being exploited by malicious Websites. Other new features include the ability to synchronize your passwords between different computers, hardware acceleration for Web videos, and the option to change Chrome's default page zoom value. Here’s a short video by Google that outlines the revamped preferences system.